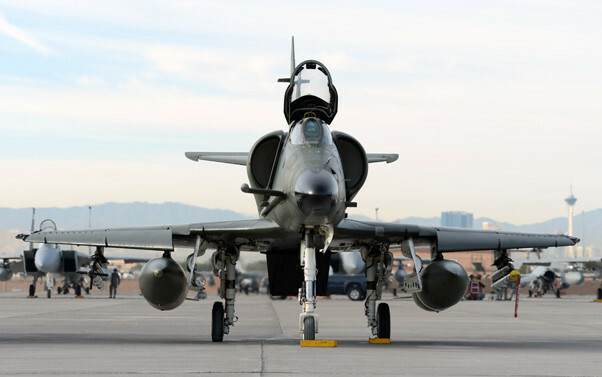 A Draken International A-4 Skyhawk parks on the Nellis Air Force Base, Nev., flightline awaiting preflight check on Dec. 3, 2015. Draken is used to support various types of military training objectives around the globe. At approximately 7:40 a.m., PDT, Aug. 18, a civilian contractor aircraft supporting 57th Wing operations crashed on public land adjacent to Nellis Air Force Base, Nev. The crash site was less than a mile from the north end of the Nellis’ runway. The aircraft was a Draken International A-4 Skyhawk. An official says a veteran pilot had just completed an exercise with a military weapons school at an Air Force base near Las Vegas when he ejected as the plane went down. Draken International’s Scott Poteet said the pilot had just finished a combat training exercise that typically lasts about an hour and a half when he self-ejected as he was returning to Nellis Air Force Base. The man who has more than two decades of fighter pilot experience was alone in a Skyhawk jet opposite Nellis’ weapons school trainees early Aug. 18. Draken pilots are civilian contractors who role-play with the trainees by pretending to be enemy pilots. The pilot is receiving medical treatment for minor injuries. In September 2015, Draken International was awarded a U.S. Air Force contract to provide adversary support. Flying the industry’s most advanced Douglas A-4K Skyhawk and Aero Vodochody L-159E ALCA fighter jets, Draken is able to replicate numerous types of threat aircraft.